Under 19? 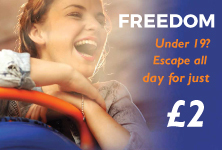 Escape all day for just £2! Thousands of young people across the west of Scotland are to benefit from a new offer by Stagecoach West Scotland which will help cut the cost of travel.